Looking for gaiters for hiking, trekking, mountaineering or running? Read our guide to the best gaiters for hiking you can buy right now. Our top list includes full-length models and shorter ones. We've picked the best 7 gaiters from the dozens available on the market. Gaiters are some of the most underrated pieces of equipment in the hiking world. While much time (and money) is spent looking for the perfect boots, many hikers fail to realize that snow and mud will still get in the tops of them. Hiking gaiters prevent that problem by forming a protective seal over your ankle. Additionally, if you’re traversing a glacier and wearing crampons, gaiters will protect your leg from their sharp points and prevent what could be a catastrophic injury. Most hikers who have worn gaiters swear by them, but for those who are unfamiliar with them, choosing the right ones can be confusing. This guide will help you understand the different components of a hiking gaiter so you can choose the best one for your needs. What Should Gaiters Be Made Out Of? Will You Need Waterproof Gaiters? 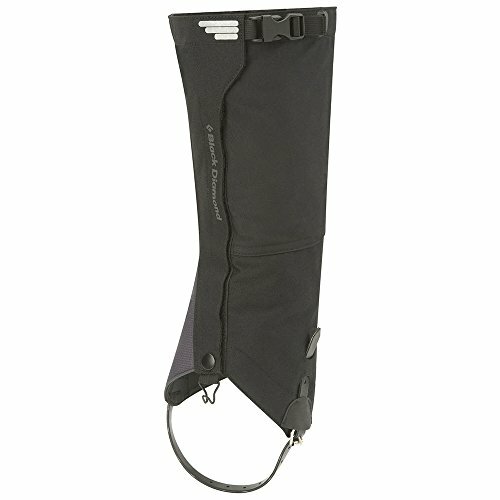 Are Gaiters Hard to Use? 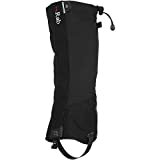 Which is the Best Hiking Gaiter? This is the first question you’ll want to consider when thinking about which gaiters to buy. Are you buying them for spring day trips where you might be in a lot of mud? Will they be used for long backpacking trips through snowfields, where you’ll need insulation and protection against ice and crampons? Do you like to trail run and need to keep your feet dry? Your hiking environment will determine the style and features that you’ll need in your gaiters. Unfortunately, no gaiter will perform perfectly in all conditions, meaning you’ll either need to buy multiple pairs for different times of year or make some compromises. Most gaiters are made from nylon, but the thickness and weave of the fabric varies. The lightweight models used for trail running are very breathable and only provide minimal protection. However, mountaineering gaiters use a thick fabric that’s made to protect against the sharp points of a crampon. 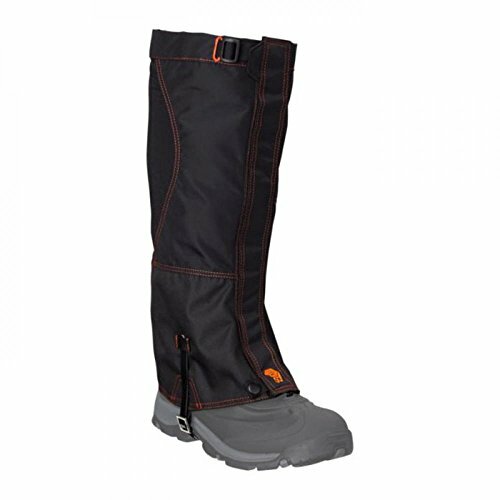 Gaiters are primarily designed to protect your ankles and to prevent mud, snow, and debris from entering the top of your shoe. 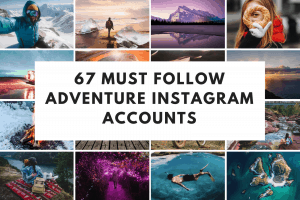 However, you’ll need taller ones for postholing through knee-deep snowdrifts than you would for walking through shallow puddles. 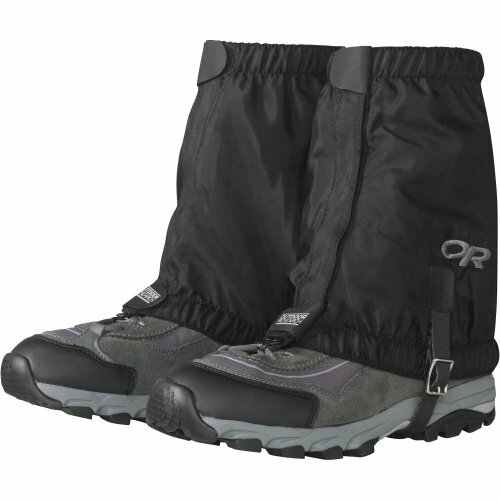 Gaiters come in three different sizes: over-the-ankle, mid-calf, and knee-length (full). Over-the-ankles are a good choice for summer hikes, when you’ll want maximum ventilation and only need protection against mud and small rocks. 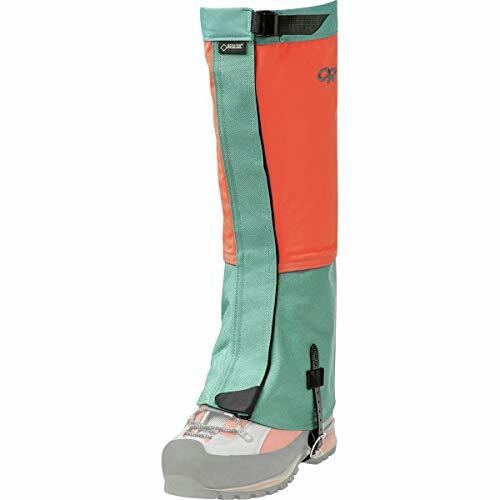 Mid-calf gaiters are good if you’ll be on very muddy trails or in light snow. They provide adequate protection for most people’s needs. Finally, knee length gaiters are necessary for heavy snow and bushwhacking. They’re usually quite thick, and the styles designed for winter will be insulating. They can cut down on your mobility, though, so only choose these if the situation requires them. That depends on the conditions you’ll be in. If you will be using gaiters in the summer, it’s best to buy a pair that is breathable, which means they won’t be very waterproof. Breathable fabrics are thinner and will only protect against light rain or some splashing from a puddle. If your legs will be in constant contact with moisture, either because you’re hiking through deep snow or because they’re brushing against wet bushes, you’ll need fully waterproof gaiters. That means they won’t be as breathable, though, so you can safely assume you’ll be sweating a bit more. Yes and no. Putting on gaiters adds an extra step to the process of gearing up for the trail, but most models have been designed to go on fairly easily. The majority of hiking gaiters have a Velcro opening up one side, so it should only take a few seconds to seal it around your leg. Gaiters also have some kind of closure system at the top to prevent mud and snow from getting down in them. The simplest models just use a drawstring like you’d find on the bottom hem of a ski parka, but some have more complicated cam buckles. 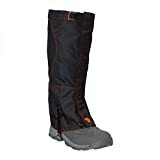 They’re not as easy to use, but if gaiters have a closure system like that, it’s probably because they’re designed to be used in harsh terrain. 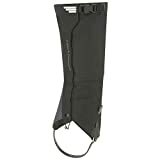 To prevent the gaiter from getting pushed up as you walk through deep snow, most of the thicker models also have an instep strap that goes around the arch of your foot. Depending on the mechanism, these can sometimes be difficult to operate with your gloves on. Sometimes you’re just not sure if the conditions will warrant wearing gaiters, so you leave them at home. Fast forward several hours, and you’re trudging through muck and grumbling about the pebble that’s made its way into your shoe. 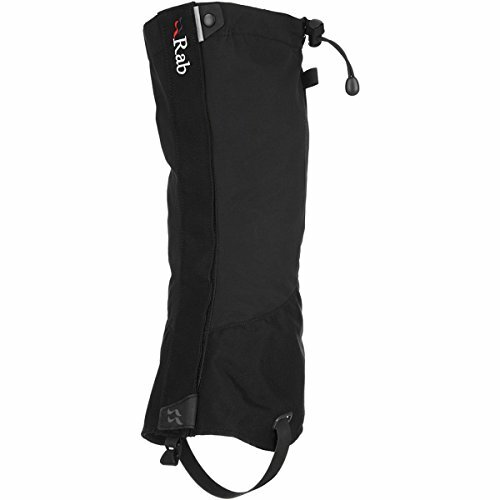 Sometimes you need a just-in-case set of gaiters, and that’s where the Outdoor Research Wrapids come in. At just two ounces, it won’t be a big deal if they just stay in your pack all day. However, if the going gets tough, they’ll provide just enough protection that you’ll be thanking yourself the whole ride home. They’re also incredibly breathable, which means you can pack them on those hot weather hikes where gaiters would usually be overkill. You won’t want to get too crazy with these gaiters, though, as they’re only minimally waterproof and just extend about six inches above the ankle. You can strap them on anything from beefy hiking boots to minimalist trail runners, but they’re only designed to keep light debris out of the top of your shoe. If there’s one problem with the Wrapids, it’s that they come with a plastic instep strap, which seems like it will be prone to breakage if you wear boots or shoes without much of an arch. But it’s just one design flaw in an otherwise great set of gaiters. The Outdoor Research Wrapids are ideal for when you need protection, but aren’t sure when you’ll need it. Pack these in case the unexpected happens. 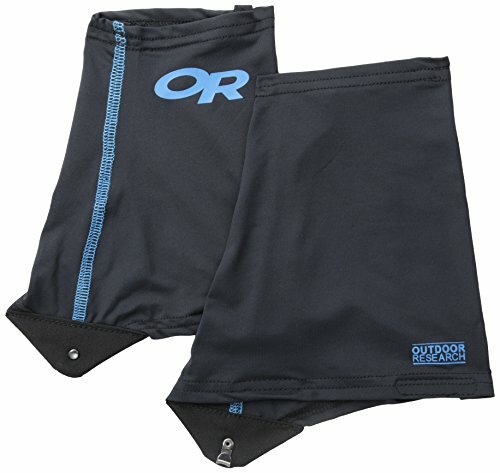 The Outdoor Research Sparkplugs are going to be your go-to gaiters for trail running. They provide just enough protection without doing anything to inhibit your movement. Coming in at just over one ounce, these are the lightest gaiters on this list. You’ll want to be aware of their limitations, though, and only use them in favorable environments. These are definitely not waterproof; they’re the equivalent of a soft-shell jacket and are only designed to repel light rain or a little trail mud. On the other hand, the Sparkplugs are one of the most breathable options out there, and will still feel great after miles of pounding workout. 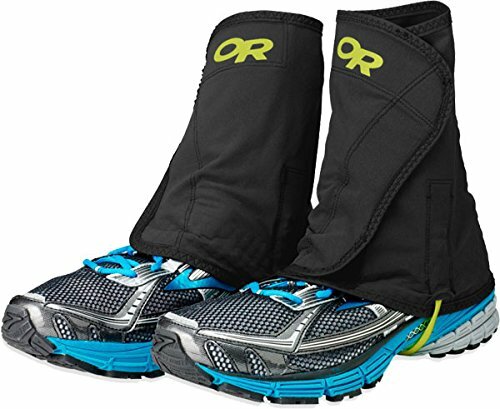 You won’t need to worry about these gaiters being too tight for running, as they’re roomy and have enough spandex in them to stretch over larger shoes. The top cuff does have a tendency to slip down after a while, which Outdoor Research seemed to be aware of when they created them. They added some loops on the interior of the gaiters, which you can rig up with elastic cord to prevent them from falling down. It seems like this should have been included in the design, though, instead of left as a DIY solution for the consumer. Still, the Outdoor Research Sparkplugs are the best option for trail runners or minimalist hikers who want a little protection. The Outdoor Research Rocky Mountain Low are a perfect example of what a mid-calf gaiter should be: lightweight and somewhat breathable, but still tough enough to get through deep snow. These are fairly breathable, which makes them great for early winter hikes where you might encounter some drifts but won’t be in deep snow all day. You won’t be sweating too badly in the Rocky Mountain Low either, so you can keep them on even if they’re not necessary at the moment. One of the biggest drawbacks to this set of gaiters is that the top cuff doesn’t get very tight, with a tough elastic band rather than a drawstring to seal it shut. Many users have said that the Rocky Mountain Low can get uncomfortable after awhile, but it is effective in keeping snow and mud out. Admittedly, the instep cord is also not terribly durable, which is unfortunate because that’s such a critical component for quality gaiters. Despite these drawbacks, this is a great mid-calf hiking boot gaiter. It’s a little more functional than some of the other lightweight models, but without the weight and stiffness that would come from a full-length gaiter. The Outdoor Research Crocodiles are some of the toughest gaiters out there - so tough that they’re actually not a good choice if you don’t see yourself using a pair of crampons or at least trudging through snow midway up your shins. The weigh 10 ounces, which is almost unheard for such a small piece of attire, but they provide rock solid waterproofing and unmatched abrasion protection. It should be noted that waterproofing comes at the expense of breathability - these gaiters, like other waterproof models, can be miserable to wear if the weather isn’t around the freezing point. The Crocodiles were designed to keep water out, but unfortunately that means they’re just as effective at keeping water in. The fit on these gaiters is a little wonky since they’re roomy enough to accommodate mountaineering boots. If you’re wearing low profile hiking boots, there’s a good chance there will be a gap where water, mud, and snow will seep in. However, they do have an excellent tightening system, with a cinch at the top, a large instep strap, and a Velcro strip down the front. The cinch can be difficult to operate with gloves on - it’s a cam buckle rather than a drawstring, which requires a bit more dexterity to tighten. The Outdoor Research Crocodiles are great to have when you’re hiking in the worst possible conditions. They’re really tough and very waterproof, though they’ll be too heavy if the conditions don’t warrant them. If the Crocodiles are too clunky but you still need something with top-notch waterproofing and plenty of protection, the Rab Latok Alpine might be for you. Weighing in at just four ounces, they’ll feel quite a bit lighter and will restrict your movement less. One of the biggest things you’ll probably notice most about these gaiters is how well they fit. There are a lot of gaiters out there that are tight at the top and bottom and look like a balloon in the middle. Not so with these; they’re sleek and form fitting, which is ideal when you’re wearing crampons and any wayward fabric around the ankle is liable to get shredded. The downside to these is that they won’t work with larger mountaineering boots. Another point in favor of the Latok Alpines is how easy they are to put on. They’ve got a thick instep strap that you can adjust with gloves on, a loop at the bottom to secure them to your bootlaces, and an easy-to-use drawstring on top. The Rab Latok Alpines strike an excellent balance, being lightweight but still very durable. If you do much hiking in the winter, these are some of the best gaiters you could have. If you haven’t quite mastered wearing crampons and always end up adding unwanted holes to your hiking pants, the Black Diamond Apex GTXs might be a good choice for you. They come with extra thick material on the sides that will prevent you from doing any damage to yourself. The Apex GTXs also excel in the waterproofing department, with a neoprene coating over super tough nylon. Of all of the gaiters reviewed here, these are some of the best at keeping the moisture out. One downside is that their slim fit is also not designed to fit larger boots, and you’ll be struggling to get that Velcro closed on a big mountaineering boot. Some users have also noted that the Velcro closure on the front is too narrow and it can get clogged with debris if you’re not careful. In addition, the plastic buckle that secures the top is not as easy to operate with gloves on as a drawstring would be. It’s also more prone to cracking, especially in the below-freezing temperatures that would make these gaiters necessary. Fortunately, the instep strap has a much better design, with the thick nylon strap threading through a steel cam. The Black Diamond Apex GTXs are a great pair of gaiters for anyone planning on doing a lot of crampon hiking and worried about the damage that they could do to their pants or themselves with just a slight misstep. The Ascents from Rocky Mountain Hardwear are an excellent choice if you need a full-length gaiter with a good mixture of toughness, waterproofing, and flexibility. While not as waterproof as the Crocodiles or Latok Alpines, the Ascents do a pretty good job at keeping the moisture out. Unless you’re hiking through slushy snow all day, your feet will stay dry. 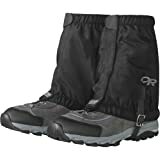 Unlike some of the other full-length gaiters listed here, the Ascents are quite roomy and can accommodate larger mountaineering boots. 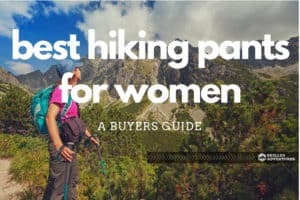 But if you have a pair of slim winter hiking boots, that’s not a problem, as the Velcro closure system will close tightly and your feet will still fit snugly inside. Some users have complained that the instep buckle has suddenly broken, making them completely useless for the rest of the trip. The metal is very thin, so you’ll want to check that buckle before you head out. The Rocky Mountain Hardwear Ascents are a good choice for hikers who might have multiple pairs of boots they’ll want to wear with their gaiters. There’s enough stretch and adjustment in these that they should fit just about all of them. The best gaiters will be the ones that fit the conditions you’re using them in - trail runners will want something more minimalist than mountaineers will. Once you know what conditions you’ll need them in, you can look for the pair that performs the best within the environment it was designed for. So many hikers forgo wearing gaiters, usually because they’re frustrating to attach and cumbersome to wear. The Rab Latok Alpines have neither of these problems and are some of the finest full-length gaiters you could ask for. They’re, easy to put on, light for their size, and durable enough for everything but crampon use. No matter which gaiters you choose, you’re sure to see an improvement in the quality of your hikes; gaiters are an amazing way to keep a little bit less of the environment out of your shoes. Never again will you be sidelined by that pebble that’s worked it’s way down from the cuff of your boot to the sole of your foot, where it can stab you with impunity. Also, no more wet socks as your make your way through a dee snow field either. Find a pair you like, and you’ll be wearing them on every outing. 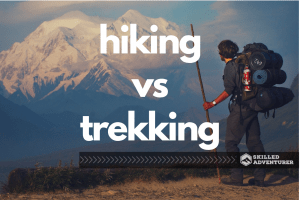 What Are The Differences Between Hiking and Trekking?